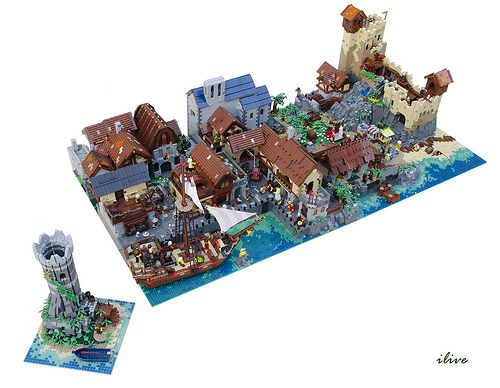 We go back in time to experience Medieval life in this diorama of a coastal village by goilive. To describe this as a village seems an understatement to me as there are a lot of buildings and infrastructure, even a port with a ship moored up. I love the changing colour gradient of the sea as it reaches the sand and the host of details little wooden jetty located centrally or the market stalls in front of the large castle. From a slightly different angle, it is easier to see some of the activities going on in this busy scene. There’s a fisherman trying to catch lunch down on the beach, a cargo load being transferred onto the ship, while a jester and unicorn entertain some onlookers in the central park. This diorama is going on display at a couple of locations in France later this month and the next; it’s definitely well worth a close-up look in person to enjoy the full scene.